My buddy, Mark Miller, came back into a room where I was just leaving and said "You've got to hear this room!" and then pulling me toward, as I call it, the Lansche / Ypsilon room. Last year the giant Lansches were shown and were very impressive, but Bugatti priced. This time around the Lansche 5.1s ($50,000/pr) sporting the same corona plasma tweeter as their big brother took center stage. Supported by a Ypsilon Phaethon Integrated amp ($24,800), the simpler approach worked perfectly. Jazz was displayed beautifully with instruments having their own space, plucked bass tight and resonated a woody vibe, and percussion, Oh that tweeter, sweet, extended, and effortless. One of the best rooms portraying a full orchestra, wide and deep stage, layered depth, great string tone, plenty of dynamic contrast. My friend Mark was right, one of the best rooms at the show. This room was huge with the Polymer MKS-X speakers ($60,000) far from any boundaries, they had soundstage down perfectly, wide, deep, and nothing �stuck' to the speakers. The system included a Weiss Man 301 Network Player, Thrax Dionysos pre, Thrax Maximinus DAC, Thrax Teres Hybrid amps, and Einklein cables. I heard the room Friday and got a hit or miss feeling on tracks I was unfamiliar with, and when played loud there was a hardness that crept in. I wasn't able to return but I bet the room got better as things broke in, or room treatments rearranged. Clayton Shaw showed a pair of open baffle speakers, Spatial Hologram M1s ($4,000/pr) in a modest system that had an Apple MacBook, Prism Lyra 1 DAC ($2250), and a Red Dragon S500 ($1995), with some GIK room treatments. The system was open, clear, had great bass (I'm starting to dig how OB bass sounds), and big dynamic swings. The stage with the short speakers was just fine for James Taylor, appearing at normal height, but an Orchestra had me looking down in an unfamiliar way, not bad just different. The speakers gave a big stage and no sounds stuck to them. The Holograms don't use DSP as Clayton worked with the speaker manufacturer to design drivers with characteristics perfectly suited to the application. Ryan Tew of Red Dragon tells me he switched from ICE to Pascal power modules to get even better depth of stage, smoother top end, generally easier listening, and more load independent of weird speaker impedance curves. The stereo amp is rated 250 Wpc @ 8 Ohms, and can be bridged for double that, need more power just buy a second amp and run them bridged, great idea Ryan. To make the amp truly universal, the improved switching power supply will run on any country's grid without any changes or switches, nice engineering. A great sounding room and a superb value to boot! The Vapor room had my friend and yours truly pushing each other out of the way to get the perfect sweet spot seat. This room was one of the very top tier sounding displays at RMAF. This system beat the AMT drivers at their own game, transparent, intimate, singer in the room, emotional vocals, stage starting behind the speakers and going way back, staggering quick dynamic bursts, deep-tight pressurize the room bass, all at reasonable pricing. The Vapor Joule Black speakers ($16,895/pr) were driven by Allnic tubes and connected with Verastarr cables, an Antipodes Music Server dished out the tunes. 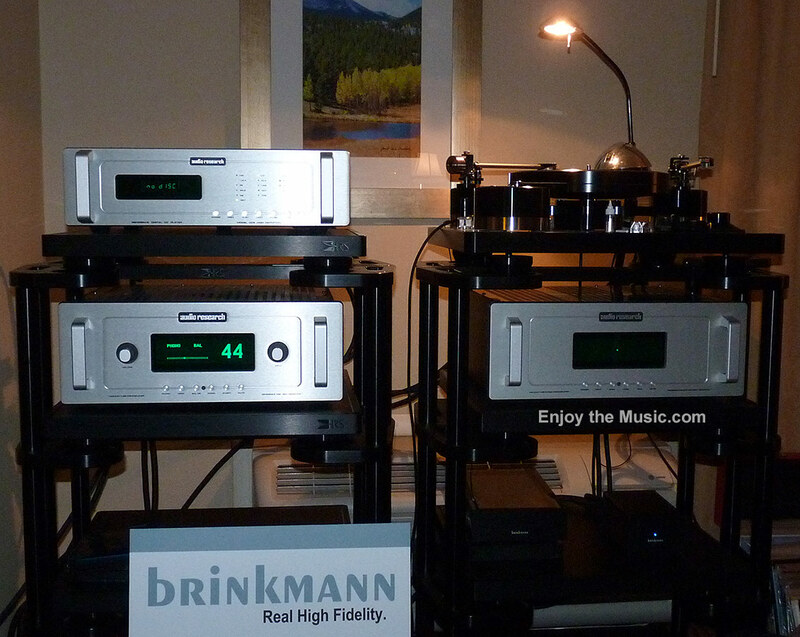 Compared to other systems, this room was top shelf sounding and bargain priced. The level of see through transparency was matched by few, and beaten by only one, at over $100,000. These guys, Pete Schumacher and Ryan Scott, really are on a hot streak with speaker design. The voicing, driver blending, crossovers, and cabinets are leading the way forward, great room. This system just made you want to stay and listen to music, mine or music I'd never heard before. Relaxing, exciting, clear, organic came to mind. Volti had their Allura A15/MT1s ($15,900/pr) looking and sounding great. Border Patrol's P21 EXD amp ($12,750) using push/pull 330Bs and external power supplied 18Wpc to drive the 99dB/W/m sensitive Alluras. Tortuga Audio showed the LDRx passive preamp ($1495) software driven and digitally controlled unit with resistive analog attenuator using light resistive diodes. The LDRx seemed to be a perfect fit despite its affordable pricing, helping the system have a clear and transparent presentation, wide stage, and big dynamic contrasts, kudos for bringing such great performance at a low cost. Another company bringing superb sonics at attainable prices was Triode Wire Labs cables, which were used to connect everything. Triode Pete had his renowned Plus power cords in use, and his American Speaker Cables and Spirit interconnects proving again that handcrafted, made in America, great sounding cables can be held to common sense pricing. The sound here had my friend contemplating a purchase, beautiful workmanship and elegant, yet exciting sound, great room. One of the biggest, and pleasant surprises in Denver awaited me at the Chapman Audio Systems room, the Chapman T-5 speakers ($4995/pr). Looking like a bulky Vandy 3, the black clothed T-5s seemed unassuming, until the music started, WOW. Explosive low bass impact, with a soundscape starting behind the speakers with great depth and width. It was very clear and transparent, effortless top end, and produced an engaging sound. Was this performance the speakers, or a tower of expensive gear hidden somewhere I couldn't see? Poking around I spied the electronics, off to the side, on the carpet (Oh my, dorm room style! ), and I had to ask, really? A decade old Odyssey amp, Hegel DAC and USB plus S/PDIF converter, Nordost entry level cables, and a laptop for the source. For room treatment, I noticed rugs on the walls. It was all about the T-5s, nothing up my sleeve, great sounding system from ordinary equipment, it was clear the speakers were the star. I find myself asking about drivers and crossover points when I'm listening to new speakers, but it never entered my mind here as they were making me smile, relax, and enjoy the music, the T-5s were embarrassing some much more expensive rooms. I really had to pull myself out of this room to keep up with my schedule, but I really enjoyed the music John Gilmore played, so much so I had to know one of the pieces. The music came from 2001: Music from the films of Stanley Kubrick, City of Prague Orchestra, fun and exciting, I'll have to get it. Easily one of the best sounding rooms at the show, I now wonder how much better their larger speakers could be? Great job making sure the average Joe has a path that's cost effective. An expensive, over $500,000, system that sounded magnificent! No excuses here, this was a great experience, and for me the best Wilson/VTL demo aside from last years timed showing of Wilson's Alexandria XLFs, also with VTL. Peter McGrath hosted the room while was there, and his setup skills were rewarded with every "audiophile" parameter in high gear. The level of see through transparency was breathtaking, effortless dynamics, no sense of strain, vocals were perfect (more on that later), wide and deep stage, powerful low bass, and disappearing speakers. Wilson had Sasha IIs ($30,900/pr) and Watchdog subs ($19,600/pr), VTL used 2 S-400 Series II Reference Stereo amps ($33,500 each) to vertically bi-amplified the Wilsons, letting the same amp topology to drive the Sashas and Watchdogs which lent to the superb coherency of the system. VTL had their TL-7.5 Series III pre ($25,000) and TP-6.5 Signature phono stage ($12,000) in the loop, Spiral Groove turntable with Lyra Etna cart, DCS supplied their Vivaldi Digital Playback System ($75,000),and Transparent and Nordost supplied cables. Perennial partners, Rick Duplisea of The Audio Alternative in Ft Collins, CO and Vandersteen, Audio Research, and Brinkman had the room that, for me, was the Best of the Show. Vandersteen partnered the prototype Model 7 Mk II speakers ($62,000/pr) with the liquid cooled M7-HPA monoblock amps ($52,000/pr). Audio Research supplied the rest of the electronics; Reference 5SE preamp ($13,000), Ref 2SE phono ($13,000),and Ref CD9 player/DAC. A Brinkman Spyder with two arms, one tipped with a Lyra Atlas (stereo), the second a Kleos mono cartridge. Why mono? All the better to compare stereo versus mono Beatles. I was lucky enough to hear Richard Vandersteen explain how helpful it is for a designer to make the amp/speaker cables/speakers as a system, knowing all the parameters involved and just having to solve for what is actually used, not to interface with all other values. I did not know Richard himself is the only person who hand builds the carbon fiber and bamboo cones, talk about involved. The cones are designed to have no breakup modes in and outside of their ranges allowing for first order crossover slopes and stunning clarity. His philosophy worked as I did not come across another system that let me hear as deep back into the recording and music as I did here. The result was jaw dropping transparency, detail, color, realistic vocals, deep tight powerful bass, soundstage starting behind the speakers and going way back, and emotionally involving. I have never The Beatles sound this good ever, the mono vs stereo was illuminating as the stereo had lots of ping pong imaging and detail, but the mono cuts were richer, better balanced, and had more color, a win for mono. After leaving this room, all my previous rankings changed, and all future rooms had a new benchmark, great system. Carl Marchisotto's NOLA room demoed a pair of Studio Grand Reference Gold speakers ($19,800/pr), driven by a KT150 fitted Audio Research Ref 75 amp, Ref 10 preamp, and CD8 player. Nordost cables connected it all. Like the sunny room, the sound here was spacious and clear, vocals focused, and dynamically exciting, and a big wide stage. Golden Ear Audio, Sandy Gross' third successful speaker endeavor showed off their flagship Triton 1 speaker ($5,000/pr), but instead of using gear priced out of line for them, used Marantz Reference electronics, PM-11S3 integrated amp ($4995) and SA-11S3 SACD player ($3995), Audioquest cables, and snuck in some Stillpoints. I got lucky and sat in the second row sweet spot, what a treat! A room where equipment prices were in check and commensurate with all items in the system... and what a system too! 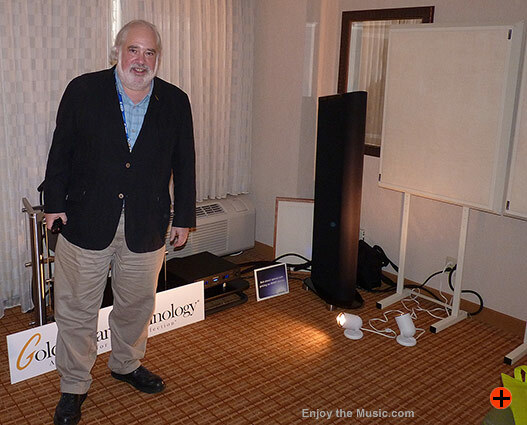 The Ttiton 1s are tall and skinny, nearly lost in the room, but they have a big voice. From such a small footprint comes a roar, deep powerful bass that pressurized the room and hit you in the chest, perfectly focused vocals, wide and deep stage, no glare on loud passages, easy on the ears, big dynamic swings, clear and transparent. When I've heard their Triton 2 speakers, they were driven by a receiver in a room with 20 pairs of speakers; the Triton 1s seemed to be a whole magnitude better even with affordable gear in the mix, great sounding system. ---> Back to main RMAF 2014 page.